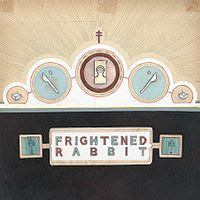 Having expanded from a tight trio into a sonically denser quintet, Frightened Rabbit's The Winter of Mixed Drinks feels like a direct sequel to 2008's withering break-up rant The Midnight Organ Fight (which while also a solid recommend, is a much stronger overall record than this one). Here, both lyrically and musically, the album dives in (literally...drifting out into the ocean is the album's central metaphor) into the less emotionally explosive but murkier months of malaise and confusion that follow a devastating breakup. Kudos to the band for taking on such nebulous emotional territory, but ultimately, the album is partially done in by the less engaging nature of its chosen subject matter. Making matters worse, though clearly the new band members were brought in to give this album a denser, murkier sound to mirror the lyrical content, leader Scott Hutchinson seems unsure how best to employ them. The end result is a mix that is definitely denser, murkier, and hazier as desired, but one that ultimately seems to work against, rather than assist, many of the album's songs. Still, despite these flaws, and the lack of even one knock out track, the album wins out on the strength of Hutchinson's excellent aching vocals (think Counting Crows' Adam Duritz with a slight brogue), a solid front-to-back consistency, and the overall likability of the band's core musical approach. Don't expect great things here, but I do believe fans of earnest, anthemic Brit-pop in the vein of U2, British Sea Power, Snow Patrol and Coldplay will find a lot to like. Cherry Picker's Best Bets: Swim Until You Can't See Land, The Wrestle, Nothing Like You, or Living In Colour.